The year was 1974….. City ambulance response times in the Bay Ridge, Dyker Heights and Fort Hamilton communities could be in excess of one hour. In an emergency time is critical. Mr. Hank Vogt, then, Community Board Ten chairman, found this to be unacceptable. A handful of civic leaders with the assistance of John Rusin began to gather documentation from the NYS Volunteer Ambulance Association and the Board of Health to justify the need for a volunteer ambulance service in this community. Numerous meetings were held in private homes for those interested in the cause. The concept grew and under the leadership of Mr. Vogt, a volunteer ambulance service to provide swift and effective emergency medical response to these communities was born. This service was to be made up of dedicated community neighbors who agreed that the most important part of these communities was its people. The demand for good health care for this growing population was a driving force. While watching the movie, Rio Bravo, a thought occurred to Hank. BRAVO is the perfect name for this new organization as it reflects the caliber of dedication needed to provide such a service. What could be a better role model than America’s pioneer, John Wayne? Many BRAVO volunteers have suffered from the “John Wayne Syndrome”, always giving, going the distance all the while keeping their own emotions unto themselves in order to provide the best care for someone else. With the help of many politicians such as then Assemblyman Bob Kelly, Senator Bill Conklin, Assemblyman Chris Mega, Congressman Hugh Carey, and with the help of the religious and civic communities, BRAVO was able to obtain its charter and certificates enabling it to operate. Bay Ridge Ambulance Volunteer Organization, (BRAVO) was now a reality. The first official meeting of BRAVO was held January 24, 1974 at St. Anselm’s Church where over 103 applications for membership were accepted. The new organization needed operating quarters and with the help of the Republican Leader Angelo Arculeo found space adjacent to the Seergy Club. It was a vacant space formerly occupied by the business of John J. Waldman and a tailor shop. On July 4, 1974, BRAVO officially responded to its first call. On August 18th, 1974, BRAVO began its 24-hour service. A second ambulance was purchased to meet the increasing community demand. BRAVO’s headquarters were dedicated on September 28, 1974. Since that time, BRAVO has purchased and remodeled the building. Today, BRAVO’s headquarters provide a home away from home for its volunteers and a learning center for the community. Under the leadership of BRAVO’s second President, Myles Davis, and through his twelve years of leadership, BRAVO became a household name. Letters of support and thanks continually poured into BRAVO. It was obvious that BRAVO was needed. BRAVO’s response time was under five minutes as opposed to the City’s sixty minutes. In addition, BRAVO’s leadership in training and advancement made them State recognized for advanced services. 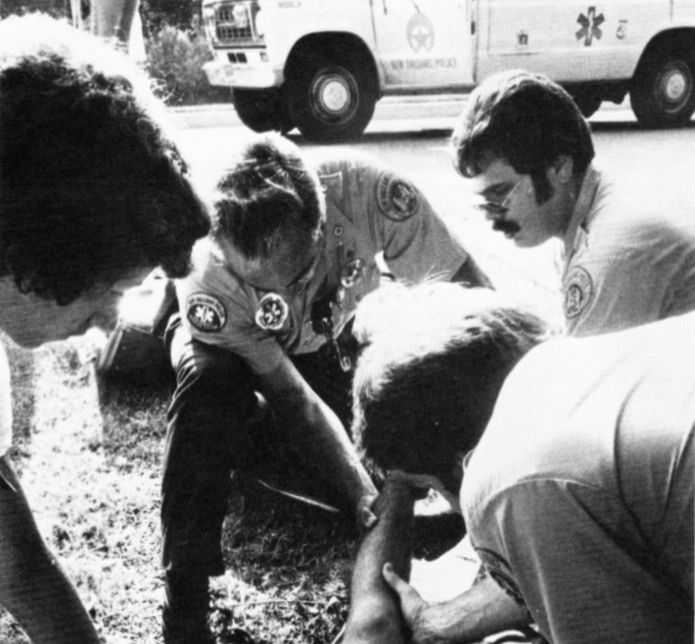 In 1977, BRAVO volunteers were chosen to be among the state’s first advanced emergency medical technicians, AEMT-P (medics), and received training under Dr. Richard Seigel at Flushing Hospital. In 1986 BRAVO was chosen to pilot the Emergency Medical Technician – Defibrillation Program, a program now used by emergency services throughout the State and Country. In 1987 BRAVO had its first of many saves using the semi-automatic defibrillator. BRAVO has always been looked upon as the leader and role model both in NY State and in many other parts of the country as well. Today, BRAVO’s EMT’s also receive on going training in aircraft disaster response, weapons of mass destruction and biological warfare response in and around New York City. In 1989, BRAVO responded to its 100,000th call for help. Averaging over 500 calls a month, our 200 volunteers provided FREE pre-hospital care to the community. In fact, when BRAVO was responding to nearly 6000 calls a year, most volunteer ambulances in the state were handling about 500 or less calls annually. As part of recruiting new members, BRAVO started a teenage group called the BRAVO Youth Squad. This is for teenagers between 14 and 18 years old. Through training, they are prepared to join the senior squad to dispatch and work on the ambulances. Our Youth Squad and their Advisors make BRAVO proud. In addition to working together as Volunteers, BRAVO members created a social support system with many activities being held throughout the year. BRAVO stands for professionalism, dedication and community service. It strives to, keeps its members on the cutting edge of pre-hospital emergency medical care. Because of the skills and professionalism of BRAVO volunteers, they have been involved in many regional incidents. New York City EMS routinely uses BRAVO’s services at mass casualty incidents, like the plane crash at Kennedy Airport in 1977, train derailments, major fires in the borough, building explosions, the Century 21 collapse in 1990, the World Trade Center Bombing in 1993 and the WTC attacks on September 11, 2001. BRAVO, under the NY City Fire Department Bureau of EMS participates in the NY City Marathon, The Five Borough Bike tour and many other very large events. They are invited to all official mock disaster drills in the city. BRAVO members have proved that at a moment’s notice, they could put together teams and respond to their neighbor’s calls for help. Over the years, Governors Rockerfeller, Cuomo, and Pataki have given citations for the wonderful work BRAVO does in our community. Mayors Lindsay, Beame, Koch, Dinkins, and Guiliani all have awarded BRAVO with City citations of excellence. Local health care providers like Lutheran Medical Center and Maimonides Medical Center have given BRAVO community civic awards. BRAVO has also received civic awards from the Bay Ridge Community Council. Resolutions honoring BRAVO have been made on the floors of the NYC Council, the NY State Assembly and the NY State Senate. BRAVO relies on financial support from the community. BRAVO does not receive Federal, State or City aid to provide its services to our community. Support comes from our neighbors, friends and family members who remember BRAVO in annual fundraising events like our spring and fall appeals. Recently our 5K Run for BRAVO, local blood pressure screenings, CPR classes and holiday greetings on 86th street have helped raise money. BRAVO also receives much needed support through memorials, bequests, and estate planned gift-giving programs. Besides our 200 volunteers, we were blessed with an Angel of our own. ” BRAVO’s ANGEL”, Mrs. Hooda Germack blessed BRAVO through her kindness and generosity. Through her legacy, she continues her unending support. Through caring people like Mrs. Germack and our many community supporters, BRAVO has been able to provide the best pre-hospital care to our community. BRAVO’s general expenses are well over $250,000 a year. A large expense is insurance coverage. In addition, vehicle maintenance, gas, electric, telephone, medical equipment and a host of other related expenses need to be met. It costs BRAVO over $200,000.00 to purchase and equip each new ambulance. Through all these obstacles, BRAVO has continued to provide FREE pre-hospital care. BRAVO’s headquarters are located at 8507 Seventh Avenue Brooklyn, NY 11228. Its current fleet includes three state of the art ambulances and one van. 2009′s Commemoration of BRAVO’s Thirty-Five years of service was recognized by, Community Board 10, the New York City Council, the NYS Assembly, the NYS Senate, many NYC Voluunteer Ambulance Corps, and our very special neighbors. This great honor is yet another historic achievement in our community. BRAVO is the largest volunteer ambulance service in the State of New York that serves one community. BRAVO is a community-based organization where friendships are made and team efforts provide the best in pre-hospital emergency care to our neighbors, friends and families. It is a group of civic-minded volunteers who leave the warmth of their homes to answer the many calls for help regardless of hour or season. BRAVO is a way to express ones humanitarian values, securing personal satisfaction and growth.